This page will capture custom methods for formatting content added to edit pages or static pages. Since the 2.2 release, AtoM has included additional security measures that escape HTML content added to edit pages - so inline HTML cannot be used in the forms to create external hyperlinks, or for stylistic changes such as bolding, italics, etc. HTML can be added to static pages, but the following custom formatting syntax will work as well. Note that if htmlpurifier is enabled in AtoM, then the supported HTML elements on static pages will be limited by the htmlpurifier settings - for more information, see: Static pages and security configuration. However, as of the 2.5 release, AtoM supports the use of Markdown in both edit pages and static pages, via a PHP library known as Parsedown. 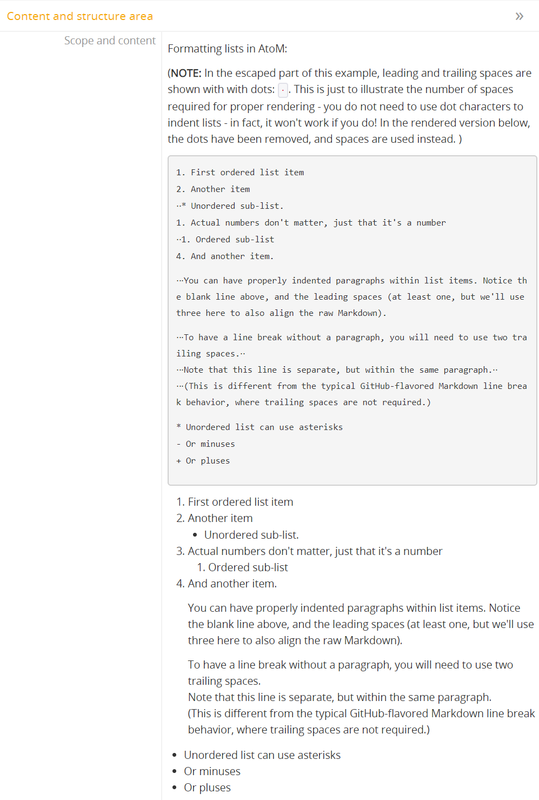 Markdown is a lightweight markup syntax for text formatting, originally created by John Gruber. It is now widely used on the web - example uses include styling README files on GitHub and other code repositories, formatting text in online forums such as Reddit, and in content management systems such as Wordpress or Grav. 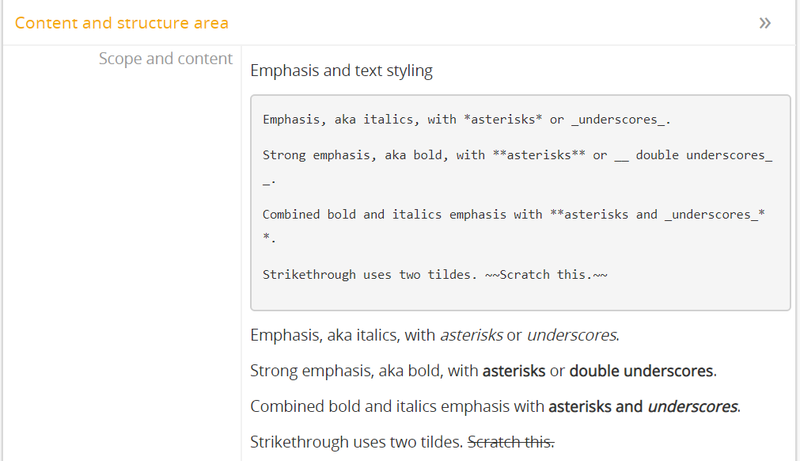 Markdown uses a series of reserved special characters and specific line breaks to indicate styling on user-added raw text in edit pages. When parsed by the Parsedown library, these elements are then rendered as styled content in view pages. For example, adding text **inside two asterisks** in an edit page will be rendered as bolded text when saved in AtoM. The following documentation will outline how Markdown can be used in AtoM. 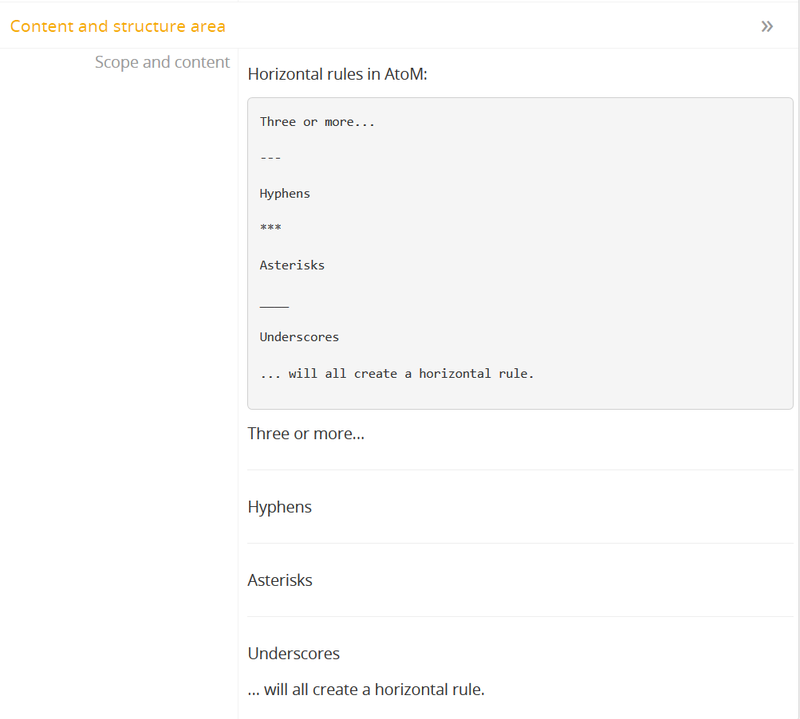 In each example, the syntax to be used in edit pages will be shown in an escaped block. Below that, an image of the escaped block, and how it will look when parsed and rendered on an AtoM view page, will also be shown. We encourage you to play around with it yourself to better understand the examples provided. Please note that not all available styling elements in the Markdown specification are currently supported in AtoM. In edit pages, formatting can be added to free-text edit fields - however, we do not recommend attempting to add it in any controlled value fields (i.e. fields with autocomplete or drop-down menus, such as the subject and place access point fields, the related descriptions field, the creator(s) field, or the repository field) when first creating new entities. After enabling or disabling this setting, a system administrator must rebuild the search index for the changes to take effect. For more information on how to rebuild AtoM’s search index, see: Populate search index. 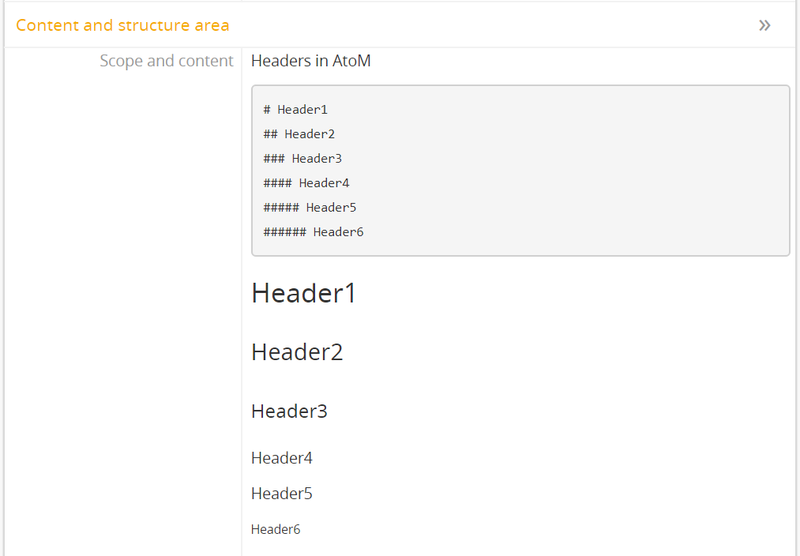 Once enabled, AtoM will render any user-added content with Markdown syntax as formatted content in view pages. Note that any incomplete elements (e.g. an attempt to bold content by putting it inside double asterisk characters, but forgetting to add the closing asterisks like so: **my content) will be ignored and will remain rendered as plain text. Headers can be used to add section titles when organizing long text-based content. Once parsed by the Markdown library in AtoM, these are rendered for display as <h1> to <h6> HTML headings. Strong emphasis, aka bold, with **asterisks** or __ double underscores__. Combined bold and italics emphasis with **asterisks and _underscores_**. Lists in AtoM using Markdown can be ordered (e.g. sequential numbering) or unordered (e.g. bullets). These generally need to be found at the start of a new line, with space above and below them for them to render properly. Note that spacing is very important to get right with nested lists. 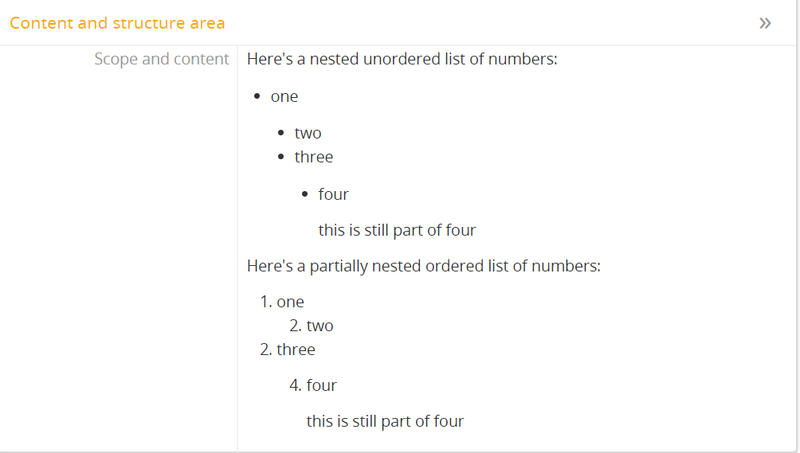 Note as well how the numbering resets in ordered list screenshot example - the actual number you add does not matter. Markdown will maintain the numbering order of the primary list based on the level of indentation and will continute the number after nesting. In the escaped part of this example below, leading and trailing spaces are shown with with dots: ⋅. This is just to illustrate the number of spaces required for proper rendering - you do not need to use dot characters to indent lists - in fact, it won’t work if you do! In the rendered version shown in the screenshot below, the dots have been removed, and spaces are used instead, as AtoM expects for proper rendering. In many cases, users may wish to add a hyperlink to an external site to the edit page of an archival description or other entity in AtoM - for example, a link to an external finding aid in the “Finding aids” field; a link to an external holdings list on a repository page, etc. The above example will lead to “display text in square brackets” appearing as a hyperlink in the view page of the entity when saved. This is my [hyperlink]. I can add more content after it. In the above example, the word “hyperlink” in the first sentence would appear as an external link. 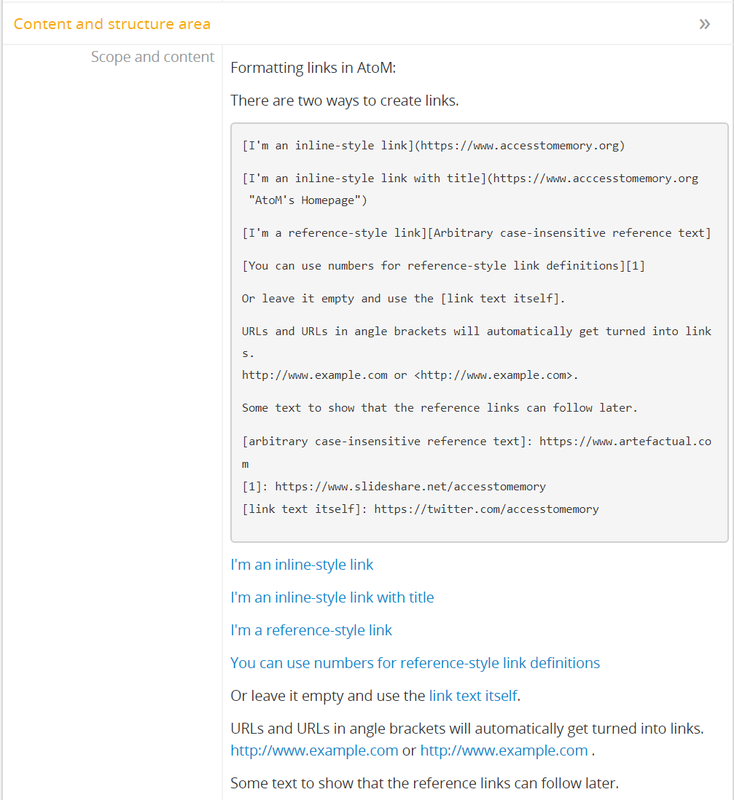 The reference text below, which tells AtoM the URL of the hyperlink, would not be displayed in the view page upon save. Go to the [global settings page](/settings/global) with this link. When rendered, “global settings page” would appear as a hyperlink. When clicked, users would be redirected to http://www.example.com/settings/global. They must be available on the public web - any login requirements, firewalls, VPN restrictions, etc. will cause the link to fail. You must provide a link directly to the digital object - that is, the link must end in the file extension (e.g. .jpg, .png, etc). This is often acheived by right-clicking on an image in a webpage and selecting “view image”, and then using the URL provided on the resulting page. Your image URLs must be HTTP or HTTPS based - FTP links or internal network shares not available on the public web will not work. Additionally, some formats (such as .svg) will not render. We recommend JPEG and PNG formats for the best results. The syntax is similar to that for creating hyperlinks, but is preceded by an exclamation mark. You can use the in-line style, or you can separate the target hyperlink to the image from the place where it is called, using the reference-style image link. 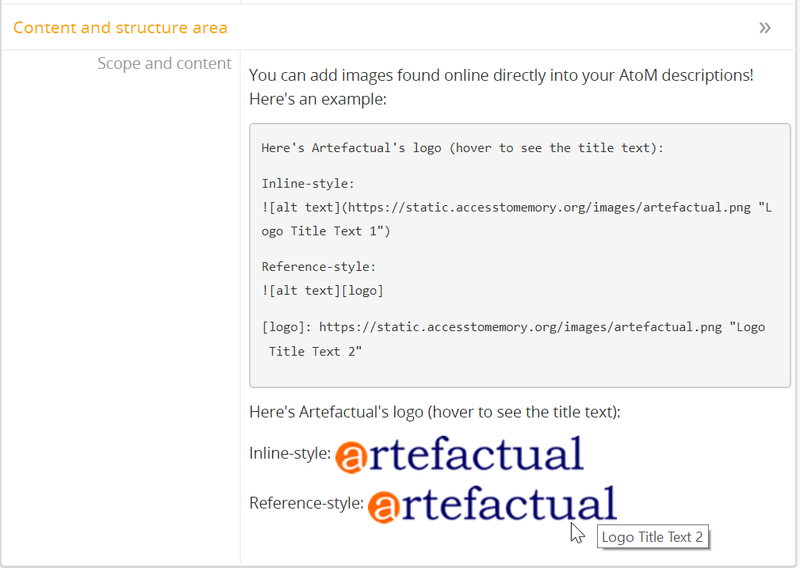 [logo]: https://static.accesstomemory.org/images/artefactual.png "Logo Title Text 2"
Because Markdown is often used to help document programming code (where spacing and proper indentation etc. can matter), it also includes a method to display individual strings, or whole blocks of text, in a raw or escaped format. You can then add more content after. Note that within an escaped code block, all content is skipped by the parser - meaning both Markdown and HTML inside the block will not render. Block quotes can be a useful way of quoting content from other sources. On a new line, they can be created by adding a > character and a space before the content. For multiple paragraphs within a block quote, simply keep adding the > character on each new line, including any spaces. Note that other markdown added in a block quote will still render properly. 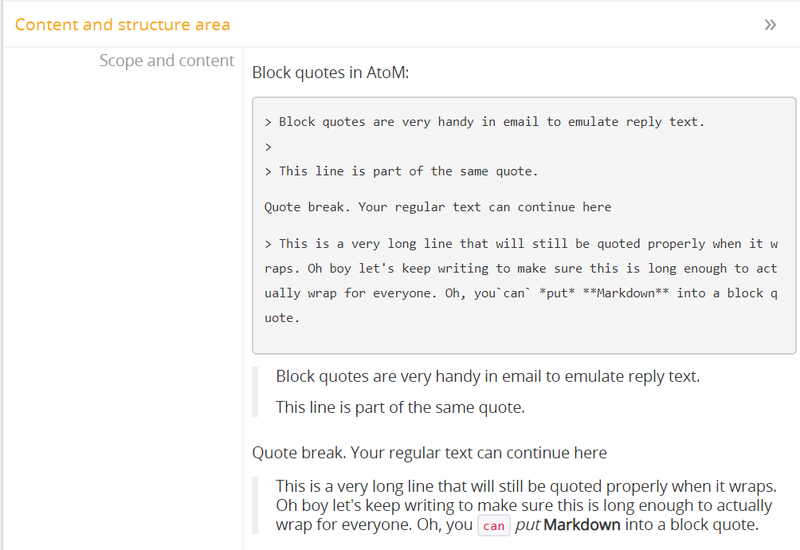 > Block quotes are very handy in email to emulate reply text. > This is a very long line that will still be quoted properly when it wraps. Oh boy let's keep writing to make sure this is long enough to actually wrap for everyone. Oh, you`can` *put* **Markdown** into a block quote. ...will all create a horizontal rule.